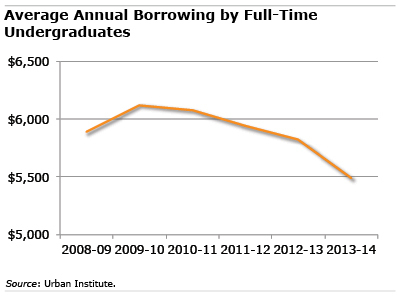 High debt accumulations – over $50,000 – remain rare among undergraduates. Still, 10 percent of all bachelor’s degree recipients owe more than $50,000, compared with just 1 percent a decade ago. 37 percent of graduate degree recipients borrow at least $50,000 – more than double the percent in 2004. A larger share of graduates of for-profit colleges have these high debt levels. The next highest levels are at private universities, with public colleges last. The longer students attend school, the more they owe. Bachelor’s degree recipients have more debt than those with two-year associate’s degrees. Graduate degrees result in more debt than undergraduate degrees, and professional degrees are associated with the most debt. Students from low-income families tend to have less debt, often because they earned shorter-term certificates or associates degrees. Students who default on their student loans, possibly due to low incomes after college, owe $14,380, on average – less than the $22,550 average for all students. Undergraduates who are no longer dependent on their parents are at a higher risk of accumulating large debts. These independent students are over 24, or are married, have children, or are foster children or wards of the courts. That’s encouraging information for undergraduates. Thanks for the positive data. I would be curious to know how this trend looks for graduate students; I have a sneaking suspicion that the curve would be steeply upward, unfortunately.